Happen to discover a funny video on YouTube online video website and can't wait to download and convert YouTube to iPod to better enjoy? Here's the tutorial which helps you download and convert YouTube to iPod just with ease. Start YouTube to iPod Converter and click YouTube button to open the box, input the URL of YouTube videos as many as you want. Click OK when finishes. 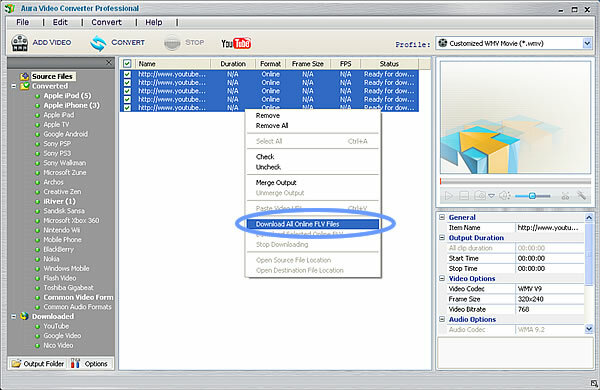 After importing YouTube videos to the YouTube to iPod Converter, select all and right click on the selected, choose the option Download All Online FLV Files. Then the downloading should begin. When all YouTube videos have been successfully downloaded, select one output video profile for converting YouTube to iPod. Here you can customize some parameters like video frame size, frame rate, video codec, audio codec, etc. Click Output Folder button in the left corner of the YouTube to iPod Converter, then you get all the converted files. Transfer the converted YouTube to iPod for watching it on the go. You should just follow Step 1 to Step 2 to get the YouTube videos downloaded on your hard disc. Get it by clicking YouTube that on the left list of the YouTube to iPod Converter, then right click the file in the main panel, choose Open File Location to get the downloaded YouTube file. After you import all YouTube videos to the YouTube to iPod Converter, select all and choose the option Merge Output. Then all the selected YouTube videos should be converted to one single file. This is unusual, but in case it happens, there are some Fix-up solutions of the YouTube to iPod. Simply go through the option Edit->Options->Video, adjust the slider bar of Audio/Video Sync, then click OK and select Default in the Audio Options->A/V Sync option. Aura Video Converter, the versatile YouTube to iPod Converter, can not only download and convert YouTube to iPod, but is also available to convert YouTube videos to any other popular video formats and media players. Feel interested in the YouTube to iPod Converter? Now feel free to download the trial version of it!